Since today is the first(!) official World Wildlife Day I thought I would post some photographs of an at-risk species I was introduced to on my trip to the Bahamas. These are Bahamian Rock Iguanas that live on many of the small islands in the Exuma Cays. 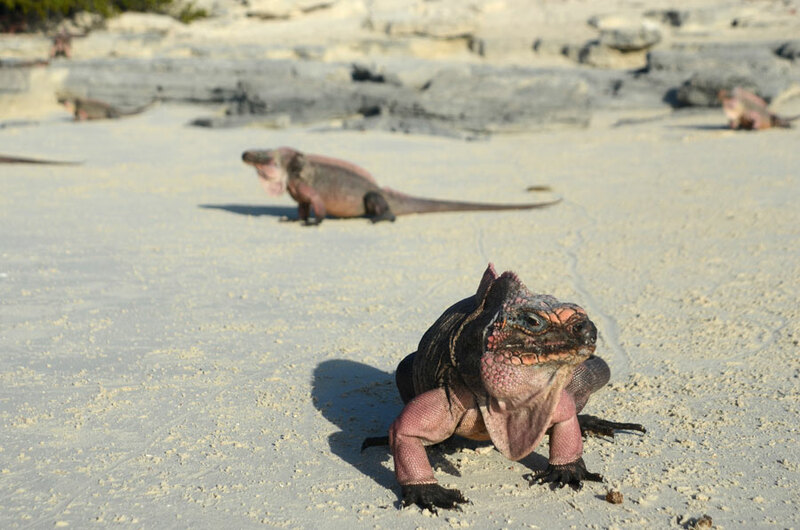 These iguanas are on the IUCN (International Union for Conservation of Nature) Red List as a threatened species. On some islands there are a number of factors putting them at risk such as poaching and other (introduced) animals including cats, dogs and feral pigs (more about the pigs later! ), but I was particularly interested in the impact of ecotourism (since I was there as a tourist myself) and the fact that they are often fed by people visiting the islands. As our boat pulled up to the sandy beach one could see many iguanas sitting there on the sand, and oddly they didn’t move away when our small group stepped out of the boat and walked to the shore. These wild reptiles are now quite familiar with human intrusion and have little fear. They were waiting for food. As honoured as I felt to be walking among these beautiful creatures their lack of fear left me kind of unsettled. Rock iguanas used to be eaten by early inhabitants of The Bahamas. Today it is illegal to harm or capture a Rock iguana. 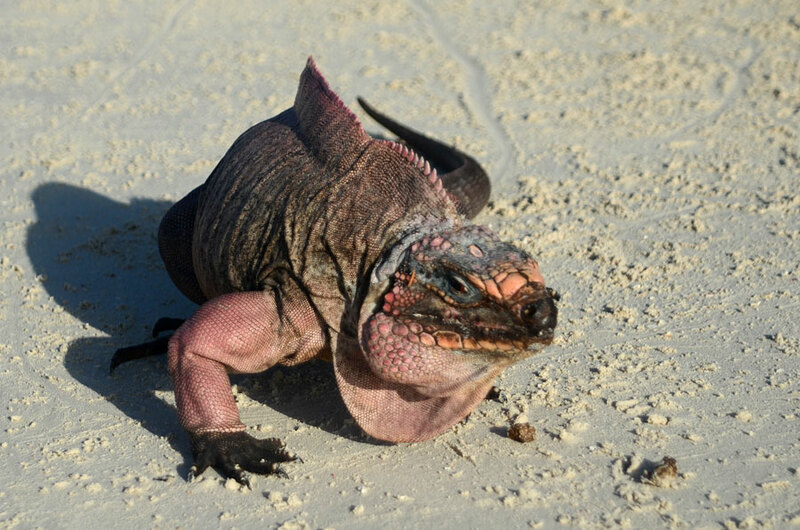 The Andros Rock iguana is the largest iguana in The Bahamas and can attain a length of nearly five to six feet. The most threatened Bahamian iguanas are the San Salvador iguanas. The serrated ridge along the spine of the Rock iguana radiates excess heat from the iguana’s body. In territorial displays this ridge makes the iguana appear larger to its adversaries. Iguanas are equipped with breakable tails which cleave off neatly when seized by a hand or a predator.A new tail begins to regenerate immediately. Rock iguanas can live for up to forty years! Thanks, Ashley. Yes, sleeves is a perfect description. They really stand out against those dark feet. Beautiful animals! Very nice idea to write about them on World Wildlife Day. It’s one step to raise awareness. They are quite beautiful, I think. Thanks for your comment! Great, I’ve never seen antyhing like them! 🙂 Wonderful shots, Karen. Interesting post. Feeding them, probably aids their survival, but changes their behaviour. Throughout history, a simple act can have profound consequences. Very interesting post, Karen, and excellent images of the Rock Iguana. Interesting conundrum between ecotourism and environmental conservation. Thanks for highlighting the issue. Very interesting post – and it’s fascinating how the iguanas have positioned themselves in the top shot. Thak you for your very informative post and and thank you for your interest in this important celebration. Excellent photos of these very cool critters Karen! We some of those around here. Really interesting and informative post, Karen!